Activation MoTomagx for MT-Box allows you to easly unnlock such phones as Motorola Aura R1, E8, EM30, EM35, U9, V8, VE66, Z6, Z6w, ZN5, ZN5tm. All those without internet connection, any limits - fully standalone. 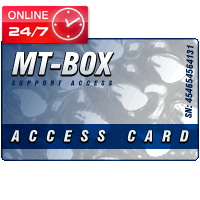 Activation MT SE for Nokia it's special activaiton that allows activation of your MT-BOX Nokia or SIemens for work as MTBOX SE Box - after this you will get unlimited accoutn for usage MT-BOX Nokia and SE. NOTE: You cannot use this activation for MT-BOX SE for activation NOKIA functions !!!!! 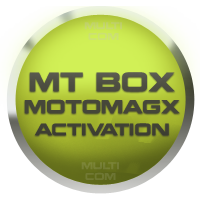 Activation MT-BOX BB5+ PA SL20/DCT4+ UNLIMITED it's special activation dedicated for MT-BOX users. Allows you to unlimited unlock of PA Sl20 phones as 6600s, 6600f, 3600s, 5220 and DCT4+ 1202, 1661, 1662, 5030 (based on UPP ID 2293). Unlock are 100% safe - fully standalone. 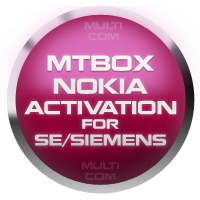 Activation MT-BOX Nokia for SE/Siemens it's special activation that allows to use MT-Box Nokia software on your MT-BOX SE or Siemens - after this you will get unlimited accoutn for usage MT-BOX Nokia. Ofcourse all functions of previous Box will be unchanged. 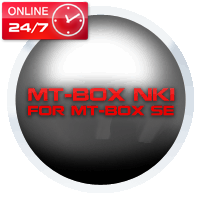 Activation MTBOX Siemens it's special activaiton that allows activation of your MTBOX Nokia work as MTBOX Siemenes - after this you will get unlimited accoutn for usage MTBOX Siemens. Advnatage of this are no more charging credits for Unlock Vodafone 226/227 via MTBOX - all unlocks are completly free then. 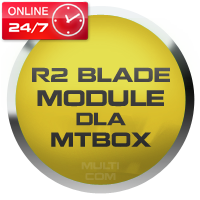 Activation R2-blade for MT-Box allows you to easly unlock ULC2 platform phones such phones as Huawei T156, Huawei T158, Vodafone 136, Vodafone 236, ZTE A66, ZTE A306. Now you don't need to wait for update - software autoanalyze on fly flash and make patched file for unlock. All those without internet connection, any limits - fully standalone. MT-Box ESN activation allows to update your MT-Box to support repair/change ESN on CDMA/AMPS (Nokia 5180i, Nokia 5185i, Nokia 6185, Nokia 8270) or TDMA/AMPS (Nokia 5120, Nokia 5125, Nokia 5160, Nokia 5165, Nokia 6120, Nokia 6160, Nokia 7160, Nokia 8260, Nokia 8265, Nokia 8265i, Nokia 8860) phones.